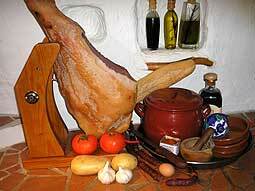 From the Serrano ham to saffron, all the essential ingredients for a fully stocked Spanish Kitchen. The average modern day Spanish kitchen is really not that different to any other modern kitchen, you can find the microwave, the blender, ready meals and packet mixes. However, there remains the traditional essentials of cookware and ingredients which are used daily in Spanish cooking and are all important to create your own piece of Spain at home. Each Spanish pantry or larder always contains a ready supply of the most essential everyday ingredients and accessories from olive oil to onions and the paella pan to the cazuela. The Spanish are sometimes criticised for the amount of oil they use in cooking, it is used in almost every recipe and is even used when frying sweet dishes. Extra Virgin olive oil, though is the oil of choice due to its renowned health benefits and unique flavour. Some people prefer an ordinary virgin olive oil but very rarely are other types of oil used in Spanish cooking as they have a blander taste, although they are considered less expensive. Extra virgin olive oil can be quite pricey but the use of a good one need not prove expensive. When using a good quality extra virgin olive oil, remember that it expands on heating so don't overdo it. Also the quality is such that it can be reused five or six times. Once cooled, the oil can be strained and stored in jars for the next time but always store oil for frying fish in separate containers. Extra virgin olive oil is used frequently in marinades and dressings and, for a milder taste, it can be mixed with other types of oil. However olive oil for cooking should never be mixed with other types of oil, as during heating possible toxins can be released. If you want to create a traditional Spanish dish, extra virgin olive oil is essential for that all important 'taste of Spain', there really is no substitute. For Spanish cooking, always have two or three bulbs of garlic at hand. Along with extra virgin olive oil, it is probably the most frequently used ingredient and it can be used in a variety of ways. Raw garlic is of course at its most powerful, rub some over a slice of toast with a drizzle of olive oil and a pinch of salt for a truly traditional Spanish style breakfast. Raw garlic finely chopped is used in marinades or for salad dressings, the amount used depending on personal taste. Cooked garlic will lose some of its bite but other ingredients in the recipe will take on its flavour. Garlic can be roasted whole, then crushed and added back to the pot, it can be inserted into meat for roasting or simply chopped or crushed and added to the pot or pan. A vital partner to garlic is the pestle and mortar. Use the pestle to squash a garlic clove for easy peeling. The mortar is essential when preparing small amounts of garlic and other herbs and spices. When mixing a variety of ingredients together, start with the smaller, hard ingredients such as peppercorns or cloves, then move on to the garlic or saffron for example. The softer herbs like parsley should be mixed in last. It is important to add liquid to your mix, whether wine, sherry or water, use them to form a paste with your ingredients. This is especially important for saffron as it must be crushed and blended with liquid before being used as otherwise your rice dish will not have an even colour. Used regularly, although quite expensive and exotic, saffron is what gives rice dishes, such as the paella, their lovely golden yellow colour. Saffron is collected by hand and is a tiny part of the crocus which explains the high cost. Only a small amount is needed so it is worthwhile keeping in your store cupboard. 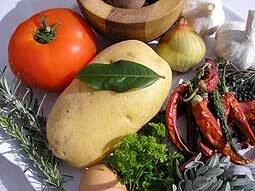 Other essential Spanish herbs are oregano, thyme, rosemary and parsley. Parsley is used so frequently that it is given away free in fish shops and butchers. Thyme is an excellent accompaniment to chicken and a sprig of rosemary makes an excellent kebab stick. All of these herbs can be grown quite easily in the Spanish kitchen garden. 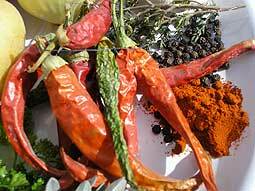 Although not used every day, two important Spanish spices are paprika and cayenne pepper or indeed whole chillies, dried or fresh. Paprika can be smoked or not, sweet (dulce) or spicy (picante) and is one of the most important ingredients when preparing the traditional chorizo for it's colour and flavour. A spoonful of paprika will add colour and flavour to any marinade or cooking sauce and add chopped chillies to any dish for added bite, such as Gambas al pil-pil. Along with saffron, to create the perfect paella, the 'paellero' or paella pan is a hugely important piece of Spanish kitchen equipment. This large round shallow pan has been used for generations to prepare the world famous Spanish dish of fish or chicken and rabbit with rice. There are different variations of pan available but the most important feature is that it must be large enough to cook a dish for all the family! The earthenware dish or 'cazuela' makes a regular appearance in the Spanish kitchen. Available from very small for serving tapas, to the enormous, they are such a versatile piece of cookware that no Spanish kitchen is complete without one. They can be used over an open fire, on the barbecue, in the oven or over the hob, plus they retain the heat after cooking - perfect for Gambas al pil-pil, a classic spicy dish of chilli and garlic prawns. To get the best out of your cazuela, soak overnight before the first use and heat to temperature gently. For larger dishes, such as the traditional winter 'cocido' or stews and soups, the Spanish 'olla' or large casserole dish which is fat in the middle and narrow at the top and bottom, is vital in the Spanish kitchen. Available in a variety of materials, it is great for cooking over an open fire. No Spanish kitchen or indeed household should be without the Serrano ham, cured for at least a year high up in the mountains, the Serrano ham is the cornerstone of traditional Spanish gastronomy. 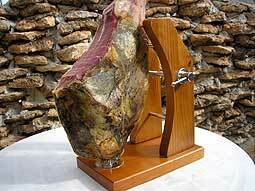 The Serrano ham is found in all bars, restaurants and Spanish kitchens and is kept on display for easy access in its specialist jamonero or ham stand. The Serrano ham, when carved in wafer thin slices, using the specialist ham carving knife, also an essential in the Spanish kitchen, makes for the perfect tapas or raciones dish. Simply drizzle with olive oil or serve with almonds, Manchego cheese or broad beans for a truly authentic Spanish delight. The best thing though about having a Serrano ham permanently in your kitchen, is that you can just carve off a slice whenever the mood takes you. The leftover bone of the ham is used to make a stock or 'caldo' essential for adding flavour to soups and stews. Another Spanish classic is the 'Tortilla de Patatas' or Spanish omelette, which is truly delicious, simple to make and requires only the most basic of essentials from the Spanish kitchen. Always keep at least a dozen eggs in your Spanish kitchen as you will need at least eight to make a good sized omelette. Potatoes and onions are also vital in many Spanish dishes and red onions are often found in salads as they are sweeter and have less bite. Never be without a few fresh, ripe tomatoes as the Spanish enjoy them almost daily in many different ways. Fresh juicy chunks are great in salads and one or two sliced with a drizzle of olive oil are popular to finish off a meal. Fresh tomatoes are often chopped or blended then slowly reduced to create a lovely homemade tomato salsa, used either on its own or added to other dishes such as spicy chorizo with pasta. For a variation to your Spanish style breakfast, chop a tomato in half and rub it over your toast with a drizzle of olive oil and some slices of Serrano ham - perfect. The 'barra' or French style stick of fresh bread is a daily essential too. It is served with every meal and many Spanish people just can't eat a meal without it! 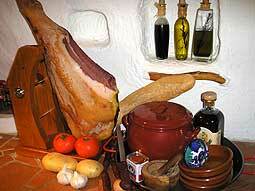 Wine is also an important part of Spanish eating culture and cooking. Red wine is enjoyed at meal times while a nice bottle of white always goes down well as an aperitif. Keep white wine handy for use with chicken dishes or steamed mussels - a favourite at the table. Rabbit and beef dishes are enhanced by a drop or two of red wine so have a bottle in the rack. Spanish wines are among the best in the world but need not be expensive so you can enjoy that added extra of Spanish warmth without breaking the bank. Many of these Spanish kitchen essentials are found easily and are indeed used everyday in other types of cooking, what makes them special is how they are used. So stock up, get creative and add a bit of Spanish sunshine to your table.